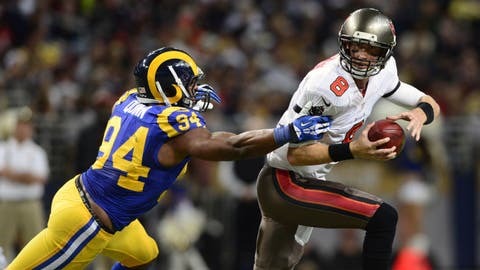 Buccaneers quarterback Mike Glennon is sacked by Robert Quinn in the first half Sunday afternoon. ST. LOUIS (AP) — TWith his NFL-worst offense already scuffling, Tampa Bay Buccaneers coach Greg Schiano had to make adjustments to prepare to face the St. Louis Rams and menacing pass rusher Robert Quinn. The result was a punishing day for quarterback Mike Glennon and another brutal offensive performance in a 23-13 loss to the Rams on Sunday. Quinn got three of St. Louis’ seven sacks and broke Kevin Carter’s franchise season record of 17 sacks set in the 1999 Super Bowl title season. Quinn now has 18 to lead the league. Schiano was left feeling sorry for Glennon, who had to scrape himself off the Edward Jones Dome turf a few too many times. Glennon got the wind knocked out of him on one sack — luckily it came with the two-minute warning, giving him enough time to recover. Glennon threw for 158 yards and no touchdowns, losing a fumble that set up Greg Zuerlein’s 48-yard field goal that put it away for St. Louis with 3:15 left. So what kind of day was it for Glennon? "I don’t even know how you judge," Schiano said. "I’m not being sarcastic. … It’s awfully hard with that situation today. It’s tough at quarterback." Zac Stacy rushed for 104 yards and a touchdown on 33 carries, and two other rookies also had big games for the Rams (7-8), who matched their victory total from last year. Stedman Bailey scored on a 27-yard reverse, and Alec Ogletree forced two fumbles. "I’ve got to do a better job of protecting the ball. I put our defense in a bad situation, and they went down and scored on that fumble. I did a terrible job of securing the ball, what I’m supposed to do, and I put the game on me," said Rainey, who had 37 yards on 20 carries. "We played behind because of me and that fumble." The Buccaneers (4-11) managed just 170 total yards, setting a season low for the second straight week. Vincent Jackson had five catches for 98 yards, with 52 coming on a pair of catches on the only Tampa Bay drive that resulted in a touchdown. The Bucs haven’t cleared 200 yards in either of their last two games and are averaging a miserable 206.8 yards over the last five weeks. In this game, Schiano’s staff left extra blockers in to account for Quinn and the rest of the Rams’ formidable defensive line. It didn’t work and only made matters worse for a unit averaging a league-low 283.7 yards on the season entering the game. "I’m anxious to watch the tape because I want to see, with some of the things we had in place, how the heck they didn’t slow them down more than they did," Schiano said. "I didn’t expect to stand back there for 3 seconds. That’s not going to happen with those guys. But I didn’t expect to be back there for (only) 2 seconds either." Glennon said he thought Quinn and Chris Long might be the best duo of defensive ends in the league, and the Rams’ front four is among the best in the NFL. "Tough afternoon. Offensively we struggled to run the football, which in turn I think made it harder to throw the football. We had seven sacks and Mike was under a lot of pressure throughout the day," Schiano said. "So, that was tough for our offense to be effective that way." James Laurinaitis added two sacks and Zuerlein kicked three field goals, including a season-best 54-yarder in the third quarter after Tampa Bay had cut the deficit to a point. "Plain and simple, we’re just not getting it done," guard Davin Joseph said. "We’re going to have to find the answer to that really soon." Tampa Bay stayed in it by forcing fumbles on consecutive Rams offensive snaps in the second quarter. Quarterback Kellen Clemens fumbled on a scramble at the Tampa Bay 4 to burn a scoring opportunity, with Gerald McCoy knocking it loose and Keith Tandy recovering. On the Rams’ next snap, Dekoda Watson stripped Stacy and Lavonte David recovered at the Bucs 47. Tampa Bay had first and goal at the Rams 9 near the end of the half before sacks by Laurinaitis and Quinn on consecutive plays pushed the Buccaneers back 16 yards. Rian Lindell’s 35-yard field goal brought Tampa Bay within 14-10 at halftime, and he connected from 32 yards on the Bucs’ first drive of the second half to make it a 1-point game. The Buccaneers managed only 45 yards on their last four drives of the game. "We just need to be better as an offense from start to finish and not just have a drive here and there," Glennon said. "We have to be hitting on all cylinders more often."